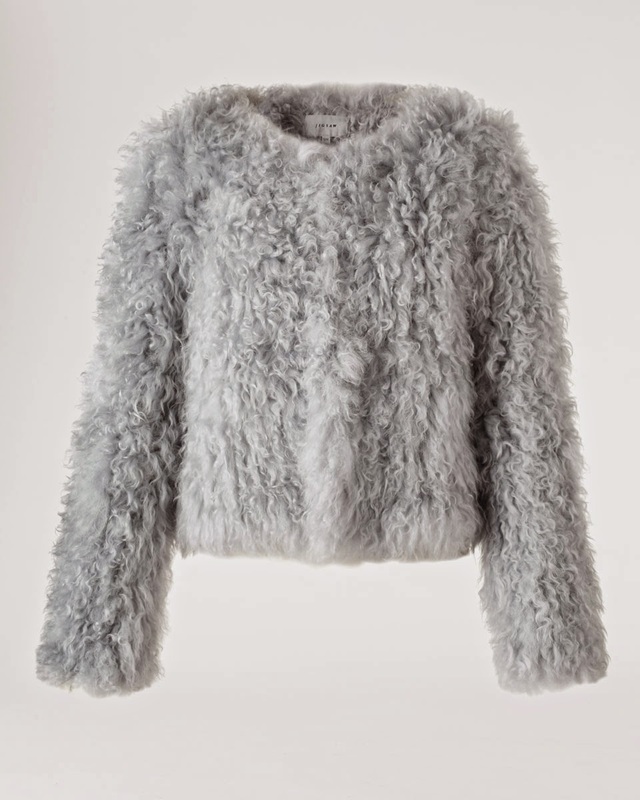 If you buy one thing this winter, make it furry! It's an instant wardrobe update. 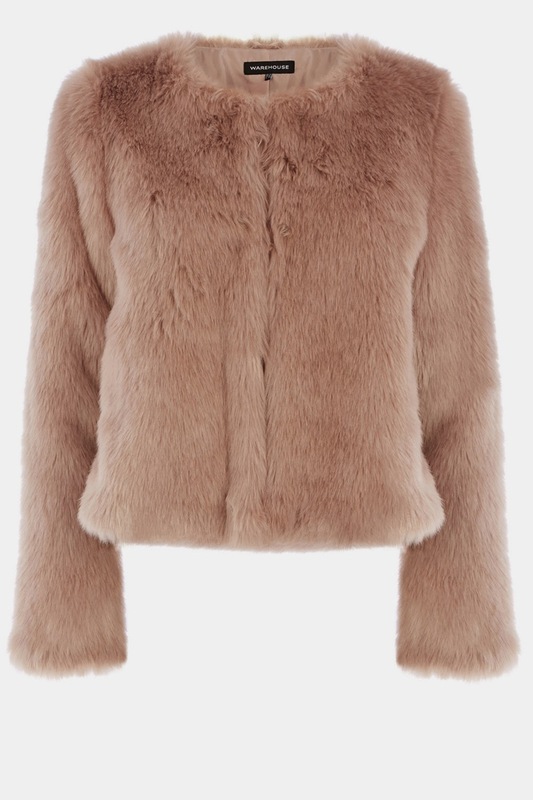 Fur jacket from Warehouse (£65) - I love the colour and the length of this jacket. I've had a fur jacket a few years but it's a bit of an in between length, whereas this one is clearly a proper "jacket" length. I love the simple styling of this Warehouse shot too. It's all very relaxed and not at all how fur coats used to be worn, which was all so glamourous. No, this is much more down to earth and accessible. Once we've got our heads around that idea and made the transition, everything else will fall into place. Skinny jeans, waxed jeans, chunky boots, trainers or skater trainers - that's the way to go with a fur coat. Jigsaw sheepskin jacket (£395) - This is such a pretty, pale silver grey. I'm going to road test it as against the man made fibres of the fur coat, for warmth. Jigsaw also do a sheepskin car coat for £995. 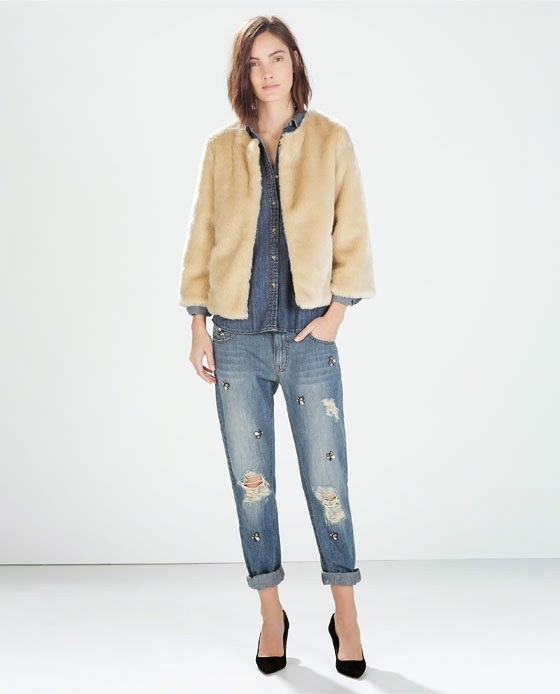 You won't be surprised to learn that Zara has a plethora of fur coats. 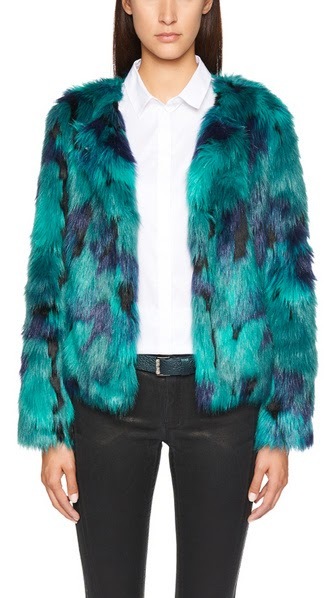 This Zara blue fur coat (£69.99) is also on my list to be tried and twirled in. 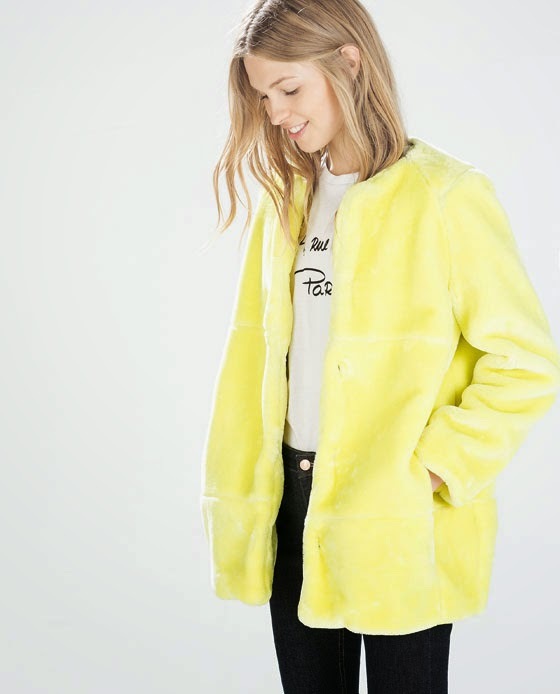 You too can do your best Easter chick impression in this yellow Zara short fur coat £69.99. Hello to my friend out there who was after a yellow coat last year and didn't get one. Could this one be for you??? I'm aware that many will feel that a fur coat is just too bulky for their frame and that it risks throwing their proportions out. First of all, there will be some that are lighter weight and less furry than others and some will be more fitted than others, so don't rule them all out. Secondly, there are also a variety of gilets (or vests as the Americans call them. A vest? I thought that was something you wore under your clothes) which work really well layered over a leather jacket, so you still get the warmth on your arms but without the bulk. I also quite often find that if my core is warm, it matters less what is going on with my arms. If all of those options fail, look to accessories. 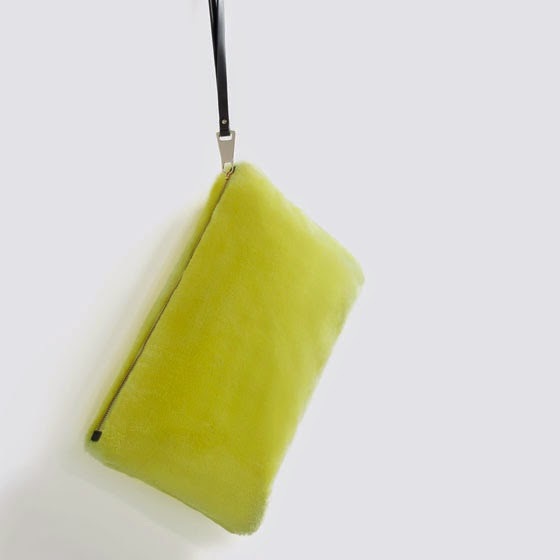 This Zara furry clutch bag is a great winter wardrobe pep up and would work well against anything black or navy. There's also a variety of fur hats, scarves, gloves and skater trainers too, so it's still possible to work fur in somewhere along the way. But back to the jackets. The Zara styling is soooo much better than it used to be. Previously the models looked like they wanted to pack up and go home. Now they may well have had good reason to look like that but it didn't really inspire people to shop in the way they perhaps would have done otherwise. 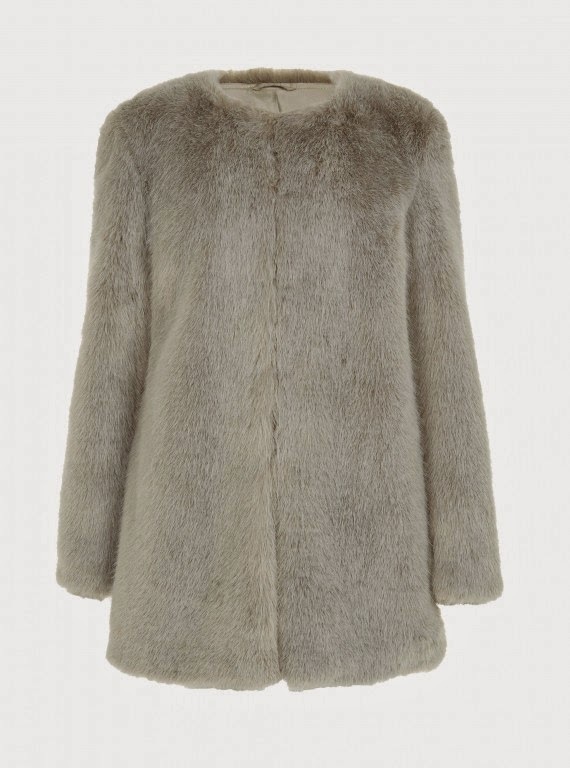 I like the simplicity of this Zara short fur jacket £69.99. I'll definitely be steering away from black. Maybe not quite to yellow but away from black. There's so much black around in the winter and this is such a great opportunity to break free from it, without looking like Joseph in his technicoloured dream coat. There are plenty of longer fur coats too - but for anyone taking a first foray into fur, the jackets are an easier option. There's only one word to describe this coat from Marc Cain (£335). Marmite. As to other options that will be appearing in the stores shortly, there's this coat from New Look for £64 and I've already mentioned the Whistles one which looks like a very pale lilac colour. So will you or won't you? My instincts tell me that there are plenty who are going "no way" but as the season progresses I suspect that minds may be changed. And I only say that because I suffer from the affliction of being fickle when it come to fashion. This morning I attended a meeting at the offices of a local modelling agency. We were there to discuss the next event for Birmingham's Jewellery Quarter, which is being held in October. It's a great event, the aim of which is to showcase the work of the Jewellery Quarter to the rest of the City. I love this particular event, not only for the fantastic people and the great atmosphere, but also because it means that I get to style models in lots of fab outfits whilst playing with diamonds and other beautiful jewellery at the same time. ...and for this afternoon's trip of "back to school" jobs which included children's haircuts, stationery buying and a trip to the Post Office, blue converse dressed it down. Keeping with the blue theme I also wore a lightweight NW3 blazer which I wore a lot last year - less so this - but it was nice to re-visit an old favourite. How are those back to school preparations going in your homes? I know that some children have already gone back, some are starting tomorrow and others start next week. For anyone with children starting new schools, at whatever age, good luck! This morning I nearly relented. I very nearly relented. Well in fact I did relent because you wouldn't normally find me in a soft play area on a Tuesday morning but no, the thing I nearly relented over was wearing winter boots - albeit pale ones. I found them, was about to put them on and then I thought to myself "you've got all winter to wear these and people will get sick of seeing them, so wear something different." That's the good thing about writing a blog you see, it makes you think about what you're wearing - well that is until some idiot goes and sells it all and then all you're left with is a few pairs of jeans and not much else. Wearing heels to soft play is good though. It's a bit like wearing them to parent's evening, or the dentist or the doctors. You see you don't have to walk far in them but it gives them a chance to make an appearance and for you to feel that you live a slightly glamourous existence, when nothing could be further from the truth. Of course I don't go in the soft play anymore you understand. Those days are well and truly over. No, instead I act as a PA to our eldest two children, making phone calls to book tickets, get t-shirts for the charity run they're doing delivered, order new school uniform (not strictly within the PA job description, more the "Mother" description really but I'll let it sneak in there for now) fill in forms for school trips etc. But it beats the soft play. ANYTHING beats the soft play! What I'm wearing: New Look jeans (still some of my favourites, good rise, good price, like the colour, look a bit wrinkly but that's probably me); GAP t-shirt, Jigsaw jersey jacket (they do these every year and they are fab for this time of year - now £39 in the sale instead of £49), Hobbs NW3 shoes, ChloBo necklace (thank you Marianna Boutique) and Oushka handbag. I just want to thank everyone who has contacted me about the items for sale in my blog sale and to let you know that I will get back to you just as soon as I can. I'm away at the moment, back tomorrow, and then I will start going through all of the emails and getting in touch with everyone on an individual basis. The response was so much greater than I ever anticipated and on reflection my timing in posting the sale and then going away perhaps wasn't great but on the other hand, with it being the bank holiday I wouldn't have been able to make that much progress anyway. We're in Dorset with friends at the moment and today we hopped on a ferry (hence the blown about hair do) to go across to Sandbanks for a look around. Obviously we will be buying there (!) Today I felt that it was a yellow day. I haven't worn this yellow sequinned striped Whistles jumper for a while now but I liked the idea of it with my Boden knitted biker jacket and with the weather threatening all sorts of things, I needed to cover my bases, so layers were required. In the end the sun shone and all was well with the world. The Style Guile Super Sale starts! Sorry that I didn't post yesterday! This is what I have been up to for the past couple of days - washing, ironing, snipping any loose threads, using my sticky roller and making everything ready for the Style Guile Super Sale, where I'm offering for sale some of my favourite pieces - many of which have appeared on the blog. I would love to wrap everything in tissue paper and make it look pretty but I probably won't have time! I've tried hard to provide good photos and to ensure that everything is cleaned and well ironed (although I must admit that I haven't had everything dry cleaned) but if I have failed in this regard, it's really not intentional! * If for any reason I have got the postal costs around my neck (not due to too much fizz you understand. Hic!) then I reserve the right to charge the amount that the Post Office charges me! LK Bennett burgundy patent shoes, size 38.5 (basically a slightly generous size 5). Brand new, bought for client - original price £115. LK Bennett ivory cross over 100% silk shirt, size 10 - brand new. £35 in LK Bennett sale. Slight mark on hem at back. Navy and metallic Oasis swing style jacket, size 8, never worn. Dry clean only. Great for work over dress, with a pencil skirt, or with jeans. Navy and white 100% cotton, 50's style Dickens and Jones jacket, size 8, machine washable - worn no more than a couple of times. All Saints dress size 8 - worn once, good with tanned legs or over leggings. Jigsaw knee length shift dress size 8. Contains 59% wool but is machine washable at 30 degrees. Hardly worn, great for work. Jigsaw knee length printed 100% silk dress, size 8 - dry clean only. Hush loose knit jumper, XS (but it's very roomy!) Worn a couple of times. Machine washable. Whistles sequinned top, 100% silk, size 8, dry clean only. Worn once. Ted Baker floral printed top, size 1 - worn a couple of times. Machine washable. Really pretty colours in this print and it nips in nicely at the waist. Whistles utility trousers with zip detail, size 8. Much prettier blue/green than is shown in the picture. The pieces below are priced at £7.50, well until you reach the £5 category! Topshop spotted trousers, 7/8th length, size 10 (not a hugely generous 10 though) machine washable. As worn in a blogging feature in Easy Living Magazine! Hush ankle length trousers (or slightly above depending on height!) 97% cotton, 3% elastane, size small, which in this style equates to more of a 6/8 rather than an 8/10. Boden wool mix jumper, size 8, machine washable - good length so good with jeans/skirts etc. Boden black wool jumper, wool mix, size 8 (same style as above) machine washable. Gerard Darel 100% silk blue and white printed blouse with belt (can be worn with or without) - size 36; generous size 8. Washes and irons beautifully. Small button missing from one cuff. Jigsaw silk, modal and cotton top with bow detail, size S. Very forgiving style! Zara cocoon style top, size small. Lovely with skinny jeans or trousers. Worn once or twice. Coast printed dress, just above the knee, size 8 (more of a 6/8 I would say). Nice silky fabric, easy to wear. Jigsaw cropped mohair and nylon black and navy printed jumper, size 8, handwash. Brilliant for layering! Zara navy and black "fur" sweatshirt style top, size S.
Ted Baker silk backed cardi, size 1. Washing instructions say dry clean only but it's fine on a hand wash cycle in the machine. Slight hole under arm which needs a stitch but this is more to manufacturing process, than wear. GAP burgundy and camel striped long line 100% cashmere jumper, size XS (size 6 for this) - small hole on lower back. It says dry clean only but I've just washed it, as I do all cashmere, and it's fine. £80 new. Oasis wool mix dress with laser cut hem detail, size 8, dry clean only. Zara slim (but not tight, more of a tailored fit) black leopard print trousers, UK 8, wash at 30 degrees. Definitely appeared on the blog when I had a party at home one Christmas! Topshop navy peg style trousers, size 8. Pockets trimmed with "leather". Good with either flats or heels. Coast 100% silk, vest style top with racer back, size S. There are poppers inside on the strap so that a bra strap can be worn without showing. Lovely under a blazer for a night out. Kew navy boyfriend style cardigan with silver stripe worked through it (94% merino wool, polyester and metallic), size S. Never worn. Hobbs NW3 purple V-neck wool jumper, cotton, silk and wool, size 6 (but a generous 6). Works well with a higher rise trouser or jean. Cos fitted cardigan, size small, little frill on the shoulder. Worn only a couple of times. Zara cream lace top, size S. So pretty and it goes with everything! Kew navy marl (almost dark denim looking) open fronted cardi, size S never worn. GAP printed trousers, UK size 8, so most shop's equivalent of a size 10. Wished they loved me like I love them! Able to be washed and ironed. Mango navy 100% cotton skirt - above the knee (on me at least). Really comfortable and great with a denim shirt or with a smarter top and heels. Size medium but it fits me so it's more like a small! Ted Baker navy silky (100% lyocell) top, size 1. Looks much better with a body in it!! "Pure" cashmere navy tank style knit - size 8, quite fitted. Only worn a couple of times. The top picture is a more accurate reflection of the colour. GAP cobalt blue relaxed style knit, XS. Looser shape, great with skinny jeans or trousers. Kingfisher blue 100% silk H&M shirt, machine washable. Worn only a few times but I noticed when ironing it that it's a little thin in places - still has plenty of life left in it though. Kew 100% linen tunic style top, size S - great on the beach. Comes to top of thigh. Topshop sequinned double layered top, size 6 - one of my favourites, ever! Zara pale pink and duck egg blue printed shirt with gold skull buttons, size S.
Monsoon Fusion pink lace top, size 8. Love the colour of this top! Boden pink fitted t-shirt (not too tight) size 8. Zara grey poncho/cape style top, size S. Great for the cooler mornings. Worn only a couple of times. GAP sleeveless cardi, cotton, silk and modal, size XS cost £14.99 in the sale, never worn. M&S beach cover up, size 8, 100% cotton brand new. NEXT pale blue chino style trousers, size 8, 100% cotton, worn only a couple of times. GAP chino style khaki coloured trousers, 100% cotton, size 8 - again only worn a couple of times. GAP true straight jeans in a 26/32 - worn in but not worn out! COS 100% navy cotton top with Peter Pan style collar, size 36. Grey/lilac GAP top with slight cross over and ruching down one side, size XS but it's not desperately fitted. Nice with a white shirt layered underneath. Zara silver sparkly shoes, size 5 - but a generous 5! There are one or two extra pieces which I still need to iron and photograph but I thought that I would get these posted before the bank holiday weekend, so that everyone has a chance to take a good look at them. Have a fabulous break! 44 and off to V-Festival - Oh help, what to wear? And today a bag is wearing me!